During the years of existence of the IC-HU Project, we have promoted differents ways to humanize the intensive care units. An of them stands out because breaks especially with the established rules: the walks out the ICU with the patients. At this point that might be a bit controversial, I would like to make two points: what are the rules? And: who wrote them?. Lately this tendency of the walks is going more an more. 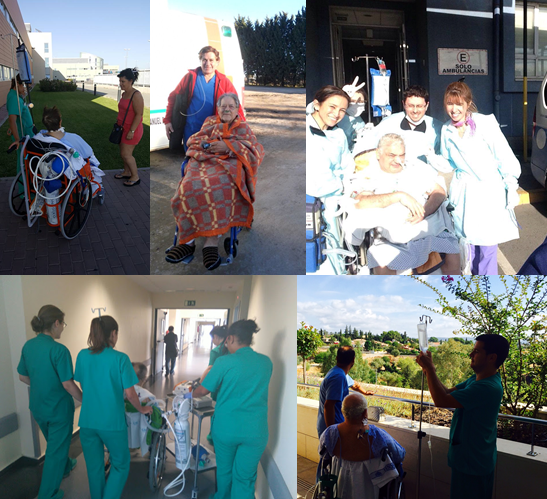 In our blog, in the networks social, every day more ICU are sharing the pictures of patients out the ICU, in a walk. We see images of patients in wheelchairs or beds, accompanied by several professionals or even by their families. Long stay in ICU critical patients with his tracheostomy tube and connected to the ventilator, or after few days of income already nearly recovered and in the point of being discharged. But is it certainly a rising value? A practice on the rise?. Or simply, is that now we share it and before was hiding? As far as I know, in 1999 I met an ICU where a sick patient with amyotrophic lateral sclerosis (ALS) was brought to a near terrace on his wheelchair, connected to a ventilator. Investigating in recent years, I’ve known from other ICU where this practice has been since inmemorial time. So… What is the reality?. The reality is that itself was made, and in some places always is has done, but little and in a hidden way. Almost as if it were a sin, something frowned upon. Something extraordinary and too unorthodox. And the reality today is that now, in many places it is put in value as a way of make a medicine of greater quality and warmth human. And in addition to much more frequently, people share their experiences… So people can see and do it. Obviously: people do so, because humanize… engages!. Just for this? Obviously not. There are many other reasons that we can come to discuss intensely. Discussing enriches and From debate our patients win. Go out for a walk for an ICU patient is an act that produces so many benefits falling under their own weight. But to do so we must take into account the obvious first premise in this type of care: individualization. It is obvious that we are not going to walk out a patient with multiple organ dysfunction syndrome, connected to mechanical ventilation in prone position or continuous Veno-venous hemodiafiltration. It is obvious that a patient who has just suffered a heart attack is not the best patient. It is so obvious… like thinking that a patient with a positive scale of delirium (CAM-ICU for example), will reduce their chances of having an episode of delirium if in the afternoon we go with him through the gardens of the hospital. The benefits of going out of the ICU for a while in selected patients are enormous. We could tell that the need of analgesia decreases, of antipsychotics, of sedatives for combat the insomnia, with an increase in the feeling of welfare, optimism, collaboration of the patient and the confidence in the team (also from the family). Walking helps the overall process and holistic care and treatments that lead to healing. And families are also integrated, all in the same team… Does anyone doubt the healing power of light from the Sun or feeling the air again?. They are #paseosquecuran (healing walks). In many UCI we have seen it for years. But we should carry out studies and trials to demonstrate it… Would it be necessary? Seriously? Do we need to demonstrate that with numbers? To be self-critical, I don´t know if in Critical Care Medicine, in Science and the art of healing, we sometimes forget the part of art and become a little extreme with the subject of clinical trials. However we have to understand the systematized and protocolized work as a via to ensure the quality. By this reason, we created time ago “The ICU walk protocol” (by the momento only available in Spanish), and today we invite to know, discuss, adapt it and… to use it. Why not? In terms of clinical trials… everything will come. Right now that is not so important.